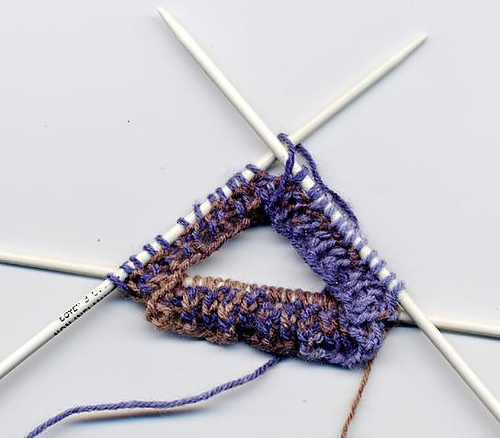 It finally grabbed me, and I couldn’t ignore it any longer-I started on a pair of socks on Monday. had finally finished my latest project on Sunday and on Monday, I started to knit socks. I thought it would be hard working with double-point needles, and the ensuing mess I’d created, but by the time I got to row 10, I thought I was doing pretty good, had it in the bag……until I found a dropped stitch~ GAHHHHHHHhh! I painstakingly worked my way back to the offending loose stitch, and also managed to work in an errant purl that turned up missing in the works. I had trouble moving from one needle to the next, which is plainly visible in the rib stitch rows. 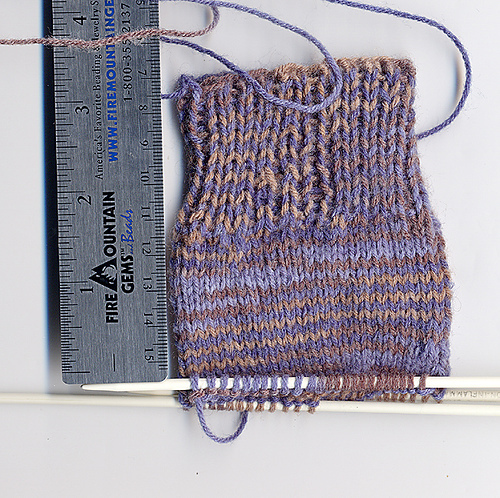 After I got past those rows, the sock became easier to handle, the needles seemed to work with me like a puppet on a string-and it felt GOOD! So here’s what the resulting first attempt looks like. I’m ripping it out once I’ve posted it- I want to start over and now that it feels right, I know how to fix my tension to and fro on the needles. click image for free pattern! PS: Check out Bernat’s Free Patterns, one can never have enough free patterns! I really, really like your socks. I have yet to start my first pair of them. I hope mine look as good as your first attempt–it don’t look half bad!